Graco's Pack ‘n Play Playard Sport is the playard designed for outdoor play and imagination. 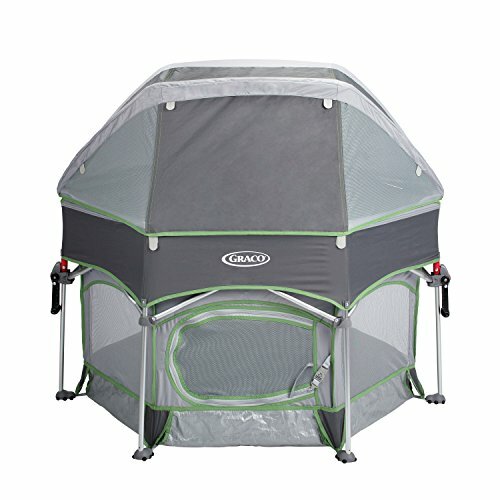 It sets up in just 5 seconds and gives your child a secure and comfortable spot, thanks to a UV50 protection-lined canopy, roomy hexagon shape and durable base (to protect from the elements). This sporty playard features mesh for ventilation and a zip-open front door that lets you transition from playard to play space to grow with your child beyond toddlerhood. It weighs just 12 lbs. and comes with a convenient carrying bag with pockets, so it's ready for your all of your child's adventures.